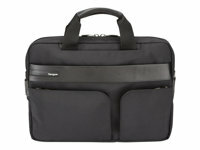 Targus Lomax Topload is a slim-line contemporary case designed to carry and protect Ultrabook and slim laptops. Leather like accents and a smart striped lining, your Ultrabook is safely secured in a snug neoprene pocket with a padded strap to limit movement while on the move. A similar pocket is also provided for your iPad or tablet and space to carry other belongings including an integrated organization pocket for accessories and a rear slip pocket for documents or newspaper. Comfortable carrying is assured with a mesh padded shoulder strap and neoprene padded carry handles.